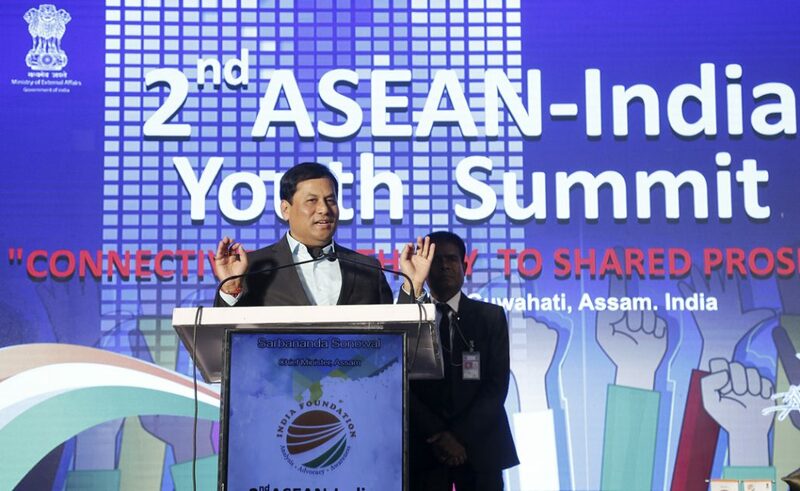 Assam CM Sarbananda Sonowal speaking at the 2nd ASEAN- India Youth Summit in Guwahati. Chief Minister Sonowal during his brief address touched upon the areas like human resources, spiritual resources, tourism resources and on the top of everything is country’s IT resources and urged upon the youth from all the ASEAN countries to explore these areas and set an agenda for working together to script a success story for all the countries of the region. He also said today, India is moving forward under the visionary leadership of Prime Minister Narendra Modi who has enunciated the Act East Policy which entails increased people to people contact, trade and other relations with countries on India’s east particularly ASEAN countries. He also said that Prime Minister has put North Eastern Region at the heart of the Act East Policy. The policy puts North East, which has so far been treated as a land locked region, at the center of India’s interaction with ASEAN. Sonowal also said many of ASEAN capitals are within 2,000 kilometre flying distance from Guwahati which is comparable to flying distance of Guwahati to many Indian cities. With locational advantage of sharing over 4500 km of international boundary –North East Region has all the potentials of emerging as a new growth hub. Sonowal also said that Guwahati which has been pitched to be the gateway to South East Asian countries, infrastructural capacity of the city is being upgraded considerably. In this context, Sonowal said the construction of an Integrated Terminal at LGBI Airport involving a financial outlay of Rs. 1300 crore is going on in full swing. Sonowal also advocated that all the countries belonging to ASEAN and BBN countries need to work as a family to realize the common agenda of the respective countries. He also thanked the organizer, India Foundation and the Ministry of External Affairs, Government of India for selecting Guwahati to host the summit. He also extended his government’s full cooperation to make the summit a grand success and fulfill the avowed agenda of ASEAN-India partnership for peace, progress and shared prosperity. Union Minister of State for Tourism K.J. Alphonse while speaking on the occasion, said in view of xenophobic ideas that are taking toll to the present day society, youth delegates from different ASEAN countries should think beyond ‘my own people, my own country’ for a mutually tolerant all encompassing world order. The union minister also said that India is famous for its tourism potentials which has helped the country to earn nearly 234 billion dollars in last financial year as he urged upon the foreign delegates to make an extensive tour to India’s North East and discover the region. Deputy secretary general of ASEAN Socio Cultural Community, Kung Phoak, also spoke on the occasion.